As usual, the Chaos Communication Camp takes places in the middle of Nowhere. That means, quite all infrastructure for the needs of thousands of participants has to be carried out to the location. The Ziegeleipark Mildenberg is connected to the local fresh water and waste water system. But it is not designed for that many people. So we have to store water for showers and taps. And even the waste water needs to be collected, so that it can be dumped in the night, when there is less usage from the villages around. Speaking of toilets: other than during past Camps, there will be no chemical portable toilets with a waste tank. This time we will provide water toilets and urinals! No stinky porta-potties beside your tent, what an advantage! 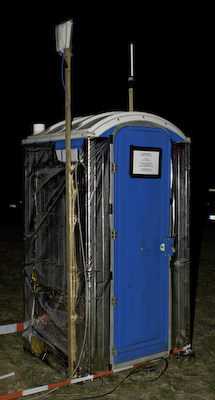 The portable toilets are storage rooms for data communication equipment only, the good old fashioned “Datkenklo”. We learned from the past years and install more showers than before. There will be shower containers like we had during the last Camp in 2011. Separated shower cabins with heated and enough water for a good shower. But keep in mind, other attendees want to shower as well, so keep your shower time short. We will help you with a button, which will activate the water for a short time only. You can push it endless times, but don’t expect a long, uninterrupted rain on your head. Furthermore there are three large basins for cleaning your dishes and tools. Please use these locations, as the waste water will be collected for proper removal. You should not empty any waste water on the ground. 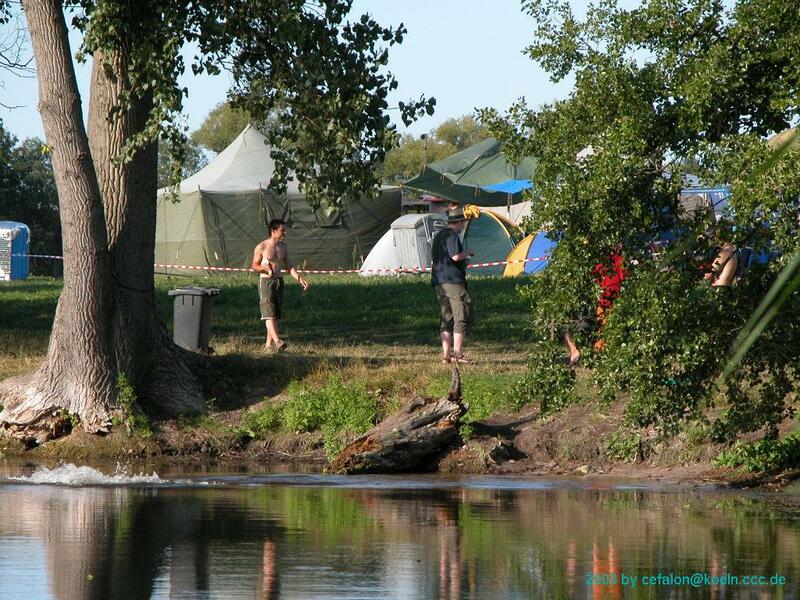 Like at the first two Camps in 1999 and 2003 there will be a lake next to the campsite, where you can take a refreshing dip. Please don’t use soap in there – the nature and animals won’t like it. Sparkled and drinking water will be provided by many food and beverage booths at the central market place. There is even an option for buying crates full of water, Mate or beer. If you or your village is interested in buying more than 10 crates, please contact boc@lists.ccc.de for the large order. The pricing will be announced soon. Pre-order your #CCCamp15 shirts, hoodies, or zippers!